Stationary control beacons can be operated somewhere along the railway network to provide a means for daily full function validation tests. Once an equipped vehicle initializes a test against a control beacon, an alarm is indicated to the driver to check the full operational state of the collision avoidance system. Typically a control beacon will be installed at a dedicated place close to the area where trains are stored while they are off-duty, but pass at least once before reaching the main operational area. 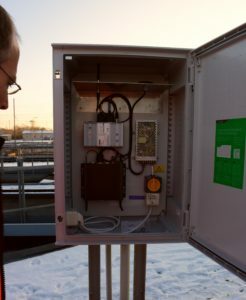 Live-Check control beacon in IP65 casing for stationary mounting at a suitable location along the track. Consisting of a robust industrial computer, a TETRA radio with 1..10W transmission power, integrated time sync and remote access module, TETRA and GSM/WiFi-antennas. Input voltage 230V. Includes wiring, operating software and beaconing software.